How Can Continent Address Social Barriers Faced By Women? Addis Ababa — We are honored to join you today in celebrating the UN Security Council’s landmark resolution 1325 on women, peace and security, along with efforts undertaken since the resolution was adopted eighteen years ago. The annual celebration of resolution 1325 provides an opportunity to take stock of the progress made and to re-dedicate ourselves to its full implementation. The women, peace and security agenda is a strong and tangible framework to guide global efforts to recognize women leaders and to prioritize their participation in decision-making. It also provides a framework for protection against sexual and gender-based violence, including conflict-related sexual violence. This is crucial, particularly in realizing the goals set in ‘Agenda 2063’, the AU flagship initiative of ‘Silencing the Guns by 2020’, and the ‘2030 Agenda for Sustainable Development’. Clearly, we will not be able to fulfill our continental and global commitments if women do not participate fully and meaningfully, their voices are not heard, their needs and priorities are unaddressed, and their contributions overlooked. 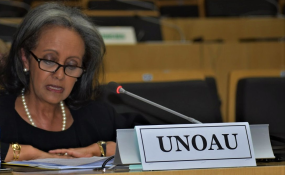 The United Nations, therefore, takes this opportunity to welcome the efforts made by the African Union in advancing the women, peace and security agenda, through the various continental frameworks. The United Nations commends the work and leadership of the AU Special Envoy for Women, Peace and Security, Mme Bineta Diop, and other women leaders, who have been dedicated advocates for the WPS agenda, and are role models for women and girls across the continent. We welcome, in particular, the launch of ‘FemWise’ and the ‘African Women Leaders’ Network’, as well as efforts of the regional network of women mediators to take concrete steps towards cooperation with similar groups in the global alliance. Secretary-General António Guterres has prioritized gender parity across the UN system, and demonstrated his commitment by ensuring gender parity within the senior leadership of the UN within his first year and a half in office. At the same time, we are implementing strategies in the peace and security architecture to increase the number of women – both within the uniformed and civilian components- across all missions and at headquarters. The United Nations is also strengthening efforts to integrate principles of gender equality by deploying dedicated gender expertise and systematically engaging women’s civil society organizations in peacemaking efforts. Mr. Chairperson - Allow me to also highlight the strong partnership between the African Union and the United Nations in the area of peace and security. Particularly commendable and noteworthy, in this regard, are the joint high-level advocacy and solidarity missions to address issues related to women’s participation in governance, peace and security in Africa, for example to the Democratic Republic of the Congo and Nigeria in July 2017; Chad, Niger and South Sudan in July 2018; more recently, to South Sudan earlier this month. These joint missions are critical in demonstrating to women in conflict situations that their voices are being heard by the international community. In the case of South Sudan, as highlighted by the AU-UN high-level delegation, the successful implementation of the recently signed Peace Agreement will depend on the meaningful participation and leadership of women at all levels. We hope that the commitments made will soon translate into action, including meeting the 35% quota at decision-making levels and ensuring the protection of women and girls against targeted attacks and reprisals. The women from the Protection of Civilians sites, civil society organizations and the Government met by the AU-UN delegation during this visit emphasized the need to hold their leaders accountable so that their country can achieve sustainable peace. They reiterated the need to be meaningfully included in designing and sustaining political solutions and in monitoring the implementation of the provisions stipulated in the revitalized agreement and stressed the need to have gender-responsive security sector reforms that provide an enabling and protective environment. This celebration of resolution 1325 provides us with a unique opportunity to strengthen and accelerate our joint efforts. The United Nations looks forward to continued partnership with the African Union in this regard.